Many women are wired to control. You're the ones who make sure the house is clean, the meals are prepared, the beds are made, the children are dressed, and everyone gets to work, school, and other activities on time. But trying to control everything can be exhausting, and it can also cause friction with your friends and family. This humorous, yet thought-provoking book guides you as you discover for yourself the freedom and reward of living a life 'out of control,' in which you allow God to be seated in the rightful place in your life. Armed with relevant biblical and current examples (both to emulate and to avoid), doable ideas, new thought patterns, and practical tools to implement, Let. It. Go. will gently lead you out of the land of over-control and into a place of quiet trust. A companion video-based study for small groups is also available. Customer Reviews For "Let. It. Go." 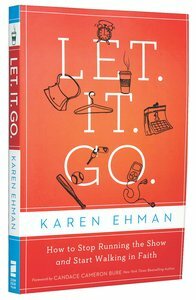 Karen Ehman's "Let it Go" is a mind-blowing read for anybody, man or woman. Ehman has a uniquely honest way of writing in which she breaks down the walls that many of us hide behind. Throughout the chapter's we are shown numerous different ways we can all be controlling, ways to combat that need for control and ways to prevent us from getting like that again. I could really relate to Ehman's writing style and really enjoyed reading this book and the truths it brought back to home. Must read for control freaks! I started this book with modest expectations (I have been known to stop reading books one chapter in  if they don't hold my interest), and was blown away by the wisdom and truth I encountered within. I have always considered myself a pretty easy going people, with mild controlling tendencies, but in reading Let.It.Go., I realised I am actually a full-blown control freak. In the section, "The Many Faces of Control", Karen Ehman describes how the need for control manifests itself in different ways, and it was this section that really hit home for me that I have a problem here. Ehman rightly brings the issue of control back to the heart and explores how this relates to our personal relationship with God. I won't go on, as I don't want to summarise the book here, but take it from me - this is a book you will not regret reading if you struggle with wanting things to go your way!